My daughter turned two yesterday, and we had 8 or 10 kids from the neighborhood in our garden for a little 2-hour-party, each one accompanied by one parent. Or so it was planned. However, my daughter then decided that she is very very very scared of the balloons that decorated the whole garden, and would not step outside, no matter what. No promise of ice creams, chocolates or lollipops or any last resort bribery tactics would make her join our guests. We destroyed all balloons. She still would not set a foot outside. Only way out was to move the party into the house, into the kids playroom. So about 20 people were cramped into the playroom. The noise level was incredible. We even brought the snacks upstairs. In no time, all toys were pulled out and popcorn was spread evenly on the floor amongst them. My daughter was sitting on my lap for the whole time watching the scene without any interest in participating. The first uplifting moment of the whole party was the parents really liking my home-baked muffins. After about 90 minutes my daughter was ready to go outside. As usual on those parties, everyone was just glad when it was over. At least, my muffins were a huge success. Preheat oven to 180C. Line muffin tin. Combine mashed banana, orange peel, orange juice, eggs, oil and agave in a bowl an mix well. In another bowl, mix oats with flour, salt and baking powder. Pour dry mixture into wet mixture and stir until just combined. Fill batter into muffin tin. 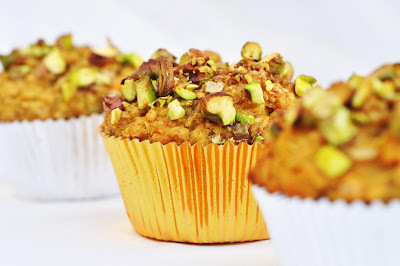 Put half a teaspoon of the brown sugar on each muffin and sprinkle chopped pistachios on top. Bake for about 20 minutes or until a toothpick comes out clean.